THE SENTENCE FORM IS KING, according to Stanley Fish. He believes that once we grasp what the different forms are, how they work and what they do, – then the rest (“the rest” being the ideas we wish to communicate) falls into place. 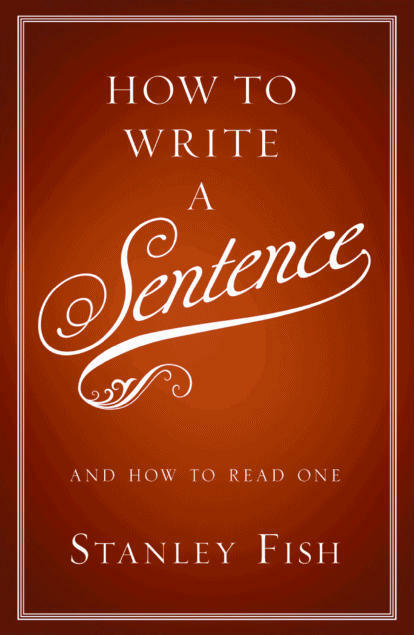 It is a convincing argument he makes in the new book How to Write a Sentence (& How To Read One). What surprised me was how much I enjoyed it. Now replace the nonsense words with good English words in a way that leads to a meaningful sequence. The exercise is useful because there is no content guiding your performance of it. All you have are forms, but they are enough. If you are a speaker of English you know – although it is the kind of knowledge you may never have articulated – that there are only certain classes of words that can follow “’Twas.” “Exciting,” “evening,” “unfinished,” “urban,” “Texas,” or “hilarious” would be okay, but “did” – “’Twas did” – would not (unless you are e.e. cummings). Throughout How To Write A Sentence (& How to Read One) Fish relies on these types of exercises to reveal to the reader the beauty and complexity of sentences. Repeatedly he invites us to put into practice what he preaches. Usually this entails re-writing a famous sentence from literature to better understand why it works. And so, “It is a truth universally acknowledged, that a single man in possession of a good fortune must be in want of a wife” becomes just another aphorism, a more sophisticated version of “An apple a day keeps the doctor away”, or “Patriotism is the last refuge of a scoundral”. Or, we’re told to take a 3 word sentence (like “Joe rides horses”) and expand it into a progressively longer sentence without losing the original “doer-doing-done to” format. Sentences, under Fish’s tutelage, become much more than a series of words strung together with punctuation marks. They become games, puzzles, jumbles, things to be played with, pulled apart and put back together. Enthusiasm is contagious, and that’s what makes How To Write A Sentence marvelous! The book positively glows with the author’s love for his subject. In many ways I found Stanley Fish’s book so intriguing because it provides entre (in a surprisingly svelte 176 page package) into a larger conversation on the development of language, Noam Chomsky’s theory of universal grammar and the genetic component involved in the organization of language. It’s a subject that I’ve been interested in since trying (and mostly failing) to read The Last Speakers by K. David Harrison. I realize that’s just me. Most people who pick up How To Write A Sentence will do so because they’re writers or discerning readers, students or teachers, or just sick (and tired!) of Strunk & White. This book is obviously not for everyone. If it’s for you, though, I advise buying it in hardcover. Not something I necessarily recommend for most books. But I anticipate this is a book that, if bought, will see heavy use. It’s a book I plan to keep forever. And at a purely practical level – if it’s that kind of book – best to make sure your copy is up to the task ahead of it. Publisher: Harper, New York (2011).